NOON: PICK UP YOUR PROGRAM AND MAP AT O.N.E. COMMUNITY CENTER* AND OTHER PARTICIPATING LOCATIONS. 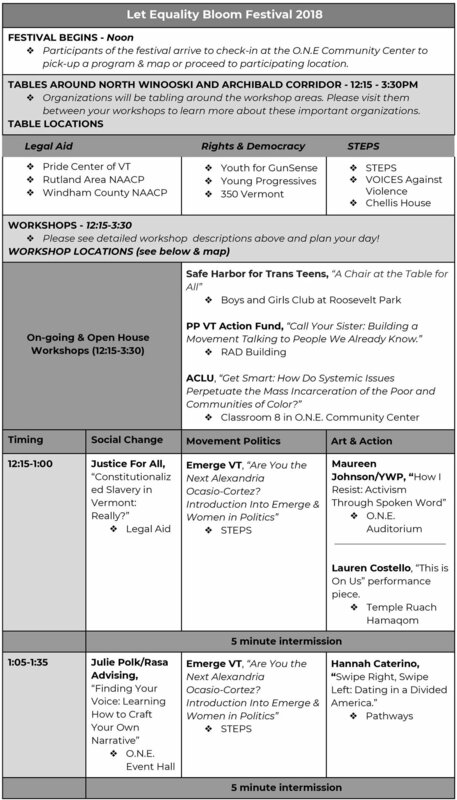 12:15 - 3:30 PM: WORKSHOPS, TRAININGS, TABLING AND OPEN HOUSES AT VENUES ACROSS THE OLD NORTH END. CHECK OUT THE MAP AND DETAILED SCHEDULE FOR LOCATION INFORMATION. 12:15 - 3:30 PM: KIDS ZONE AT ROOSEVELT PARK. FREE LUNCH FOR ANYONE UNDER 18 (NOON - 2:30 OR AS SUPPLIES LAST. ), FACE PAINTING (2 - 3:30), BOOK NOOK, SUNCOMMMON SOLAR BUBBLE MACHINE, GAMES AND MORE! LACTATION TENT PROVIDED BY MAMAVA WILL BE ON SITE. 12:15 - 3:30 PM: MAKE YOUR OWN PROTEST ART AT ROOSEVELT PARK. MAKE YOUR OWN PROTEST FLAG, S AND COLLABORATE ON A LET EQUALITY BLOOM BANNER! 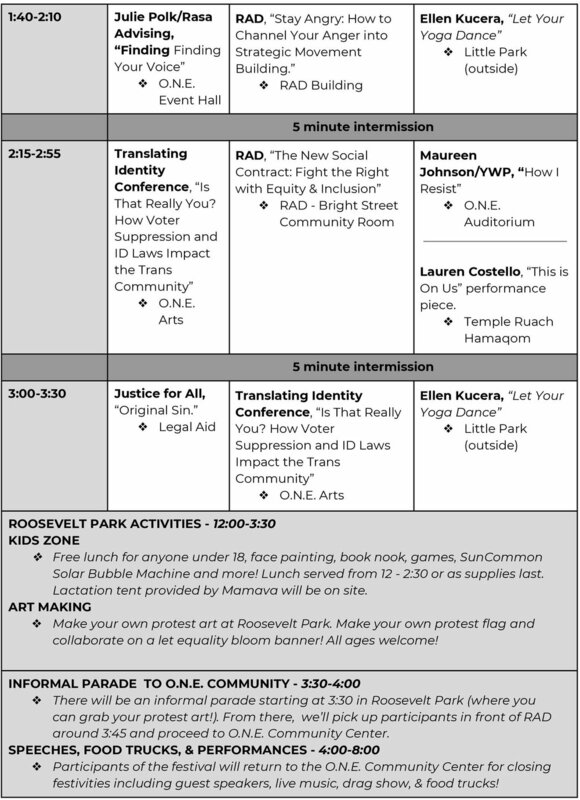 3:30 - 4 PM: WE’LL BE INFORMALLY PARADING DOWN TO O.N.E. COMMUNITY CENTER FOR EVENING ACTIVITIES STARTING AT ROOSEVELT PARK SO YOU CAN GRAB YOUR ART! 4:30 PM - 8 PM: CELEBRATE. ACTIVATE. LET EQUALITY BLOOM! OUR CLOSING FESTIVITIES INCLUDE GUEST SPEAKERS, LIVE MUSIC, AND A LET EQUALITY BLOOM DRAG SHOW. FOOD VENDORS ONSITE FEATURING A SINGLE PEBBLE FOOD TRUCK, LUISA’S HOMEMADE WITH LOVE PIEROGIS AND SISTERS OF ANARCHY ICE CREAM. BAR CATERING FROM DUINO DUENDE. *VARIOUS LOCATIONS ARE PARTICIPATING IN THE FESTIVAL, BUT O.N.E. COMMUNITY CENTER IS OUR HOME BASE - AND THERE WILL ALWAYS BE SOMEONE THERE TO ANSWER QUESTIONS. A fun, highly interactive workshop where you'll learn the basic narrative principles to craft a true, personal story that's gripping and persuasive, and couple it with practical, effective techniques for connecting with an audience and commanding a room. I'm an actor and writer who's taught with The Moth, the National Shakespeare Company, and the CUNY Graduate School of Journalism — I can't wait to hear what you have to say! ACLU Smart Justice Get Smart: How Do Systemic Issues Perpetuate the Mass Incarceration of the Poor and Communities of Color? The impact of mass incarceration on our communities and an overview of the State’s Attorney elections - who is your SA and how can you play a role in electing a SA who addresses the underlying systemic issues that perpetuate the mass incarceration of the poor and communities of color? Constitutionalized Slavery in Vermont: Really? A closer look at the US and Vermont constitutions and an analysis of the implications of the language of slavery. Breakout group discussions and action planning. The Young Writers Project social justice-themed workshop will consist of writing prompts engaging participants in addressing issues such as positive affirmation of identity, racism, sexism, classism, homophobia and xenophobia through the lens of empowered self expression. Participants will experience a safe supportive space to imagine and create spoken word pieces around the issues that matter most to them while finding mutual affirmation through shared story. Lauren Costello is a Burlington based multi-instrumental musician. She performs her solo music under the moniker 'ouzkxqlzn' and plays cello in the Wren Kitz band, the Dead Shakers, and Zentauri. For the festival, she will perform a piece titled 'This is On Us,' which collages a collection of media clips surrounding the Trump administration's policy of separating immigrant children and their parents at the US border, over a soundtrack of guitar and cello. A political piece, it delves into the methods, actions, and consequences of the policy of separating children along with the broader issue of targeting asylum seekers. Building equality and creating a place at the table which is welcoming to all. Interactive story thru art exhibit on one families journey thru a transitioning youth. How can two people come together when it feels like the world's being torn apart? K. Hannah Caterino, M.A, M.Ed., of Inner Grace Coaching LLC will lead a workshop on dating as an activist in these divided times. Let Your Yoga Dance combines yoga and dance with inspiring and uplifting music for a joyful movement experience. Moving to a special Let Equality Bloom soundtrack based in love, empowerment, and community we will begin with gentle warm-ups, join together in community, send our love to the world, have fun, and finish with some empowering relaxation. You will leave feeling lighter and happier and more connected to your community. This class is for everyone - All ages, body types, and levels of fitness welcome! No experience is needed in dance or yoga and no fancy clothing or gear required. Come ready to move and have some fun. Listen to a live podcast with Reggie Condra and a special guest TBA! Transgender folks are increasingly targeted by complex, inefficient, and exclusionary voter registration systems that aim to silence their voices and votes. Learn how discriminatory policies and procedures keep transgender voters from the polls, and how we can work to impact a shift from voter suppression to voter empowerment. Are You the Next Alexandria Ocasio-Cortez? Introduction Into Emerge & women in politics. Many times in activism, we overlook that our people are all sitting on valuable networks of people they know. This workshop provides a tool that ANY campaign can use to motivate people to strategically analyze who in their personal networks they can reach out to bring into the movement. Strategies for moving beyond the resistance to policy change and implementation. Creating a more equitable, democratic and inclusive political and economic system by focusing on 5 core strategic pillars: 1) Public Goods for All 2) Our Relationship with Land 3) How we use Labor 4) Financing with Dignity and 5) From Exclusion to Equity and Participation.